A-ESSE s.p.a. is subject to application of Legislative Decree no. 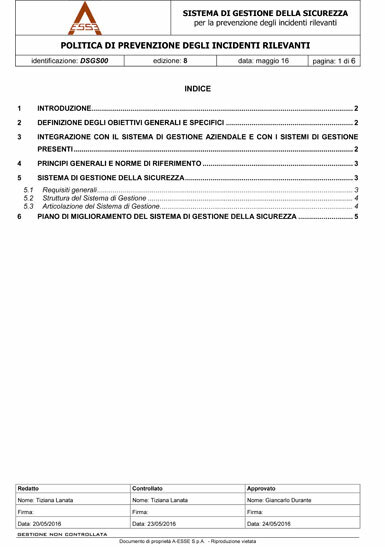 105/2015 (formerly Legislative Decrees 334/99 and 238/05) and has adopted all the measures required for compliance under the decree, including implementation of a Safety Management System proportionate to the risk of significant incidents occurring in connection with use of hazardous substances, a Safety Report and an In-house Emergence Response Plan. The production facility is subject to IPPC regulations on the basis of the type of work performed in the plant. The company began the procedure of obtaining authorisation in 2004 and completed it in 2007 when it obtained Integrated Environmental Authorisation (A.I.A), periodically renewed since. 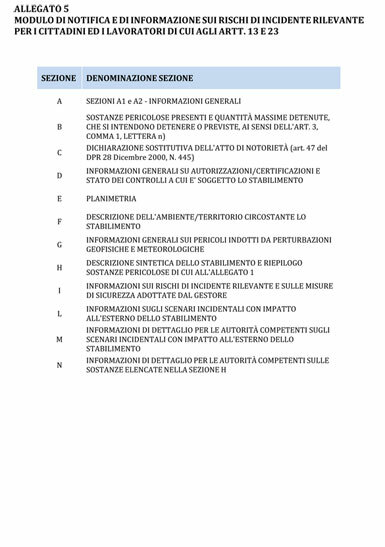 In the 28/02/2006 Ministerial Decree regarding “Implementation of Directive 2004/74/EC concerning the 29th adaptation to technical progress of Directive 67/548/EEC concerning the classification, packaging and labelling of hazardous substances”, Zinc Oxide was classified as an environmental hazard. A-ESSE is constantly committed to keeping the information appearing on its product labels up to date, also in view of EC Regulation No. 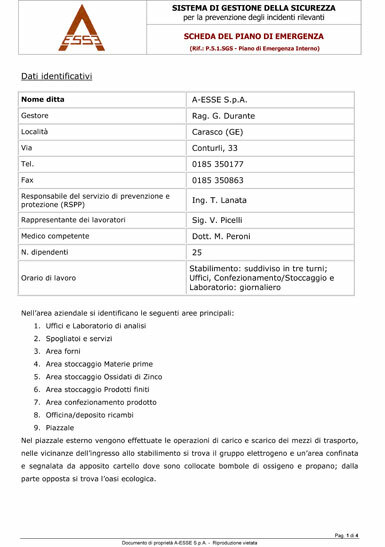 1272/2008 regarding the classification, labelling and packaging of substances and compounds. 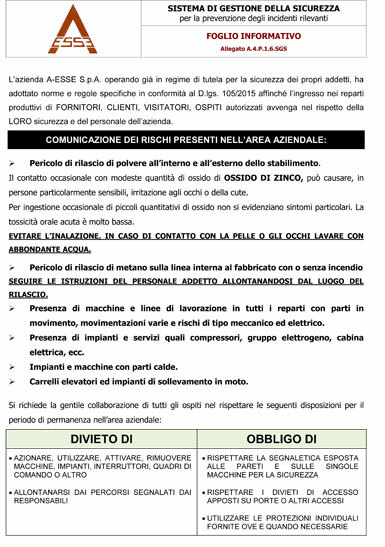 2017 © A-Esse - Fabbrica ossidi di zinco. Questo sito utilizza cookie propri e di terze parti per assicurarti la migliore esperienza di navigazione. Per saperne di più o negare il consenso a tutti o ad alcuni cookie clicca qui.